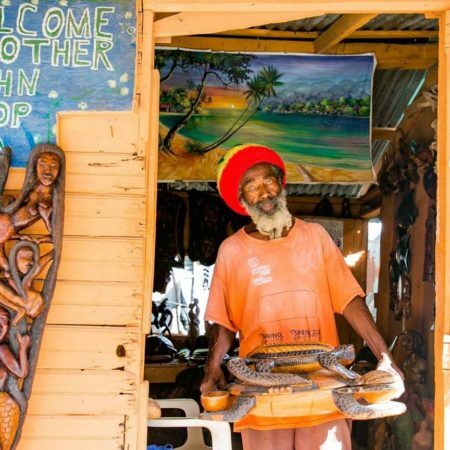 A better TMRW begins TDAY on the stunning Caribbean beaches of Jamaica as the Tmrw.Tday Culture Fest kicks off its Inaugural gathering this May 17-23. 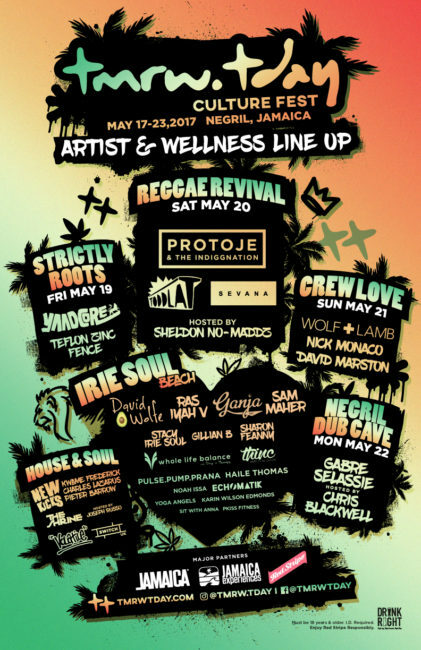 Best known for its 7-mile beach, Negril will serve as home base for Tmrw.Tday which will encompass all things music, wellness, gastronomy, environmental activism, and island adventure inviting sun drenched attendees to seek a higher purpose during a week-long, paradisiacal exploration. 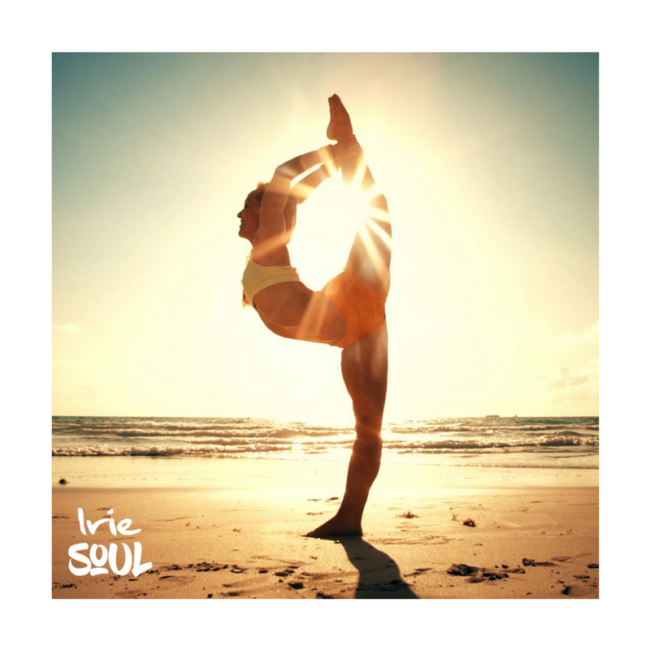 Also found on Irie Soul Beach is a daily series of holistic workshops, fitness sessions, and meditations curated by Irie Soul Program Directors and self-care guides Stacy Chang-Christoforou and Gillian B. who will deliver a message of empowerment, holistic health, yoga, spirituality and self-love to the diverse platform of offerings. Founder of Irie Soul, Stacy Chang-Christoforou will lead attendees on a journey to self-discovery in addition to celebrating her Jamaican heritage throughout the diverse programming. As part of the wellness schedule for the festival’s first foray, participants are invited to push the boundaries of their current practices by diving into unique classes such as Sunset Acro Yoga led by Toronto-based performance duo, the Acro Buddhas. Combining the ancient practice of yoga with acrobatics to make movements that work together harmoniously, Acro Buddhas Miranda and Ryan will host beginners’ workshops to teach their practice alongside showcasing their advanced moves during nightly sunset performances. Broadening the mind, body and spirit within the confines of Tmrw.Tday lies a trove of unique daily offerings and activations designed to help attendees carve out a more conscious lifestyle – for participants of all ages. Activities such as Konscious Kids’ Beach Day led by 16-year old motivational speaker, youth health activist, vegan chef and descendent of Jamaican parents Haile Thomas: the youngest certified Integrative Nutrition Health Coach from the Institute for Integrative Nutrition. Inviting revelers to consider alternative ways of life, Tmrw.Tday’s immersive events will also facilitate a progressive movement geared towards natural healing, environmental preservation and sustainability. Celebrating Caribbean heritage and global cultures alike, Tmrw.Tday welcomes a beautiful ensemble of reggae, house, and other musical acts such as Protoje & The Indiggnation Live In Concert, Wolf + Lamb, Toddla T, Chris Blackwell, Gabre Selassie, Yaadcore, Nick Monaco, David Marston, Teflon Zinc Fence, and Echomatik. Attendees will be further captivated by the plethora of experiential offerings such as the 7 Mile Organic Food Festival, the pioneering and ganja inspired 7 Miles of Green, the Marley Coffee Beach Café serving Premium Blue Mountain Coffee, Juice Bar, massage & spa sessions, essential oil treatments, Arts & Crafts exhibit, and an endless amount of beachside activities.